The 11 Pop Artists portfolios were a new center of gravity in America’s art history. These edgy compilations of fresh prints from then-emerging artists like Roy Lichtenstein, Andy Warhol and Tom Wesselmann, among others, launched new dialogues as artists engaged printmaking as a way to broadcast novel ideas more broadly. From 11 Pop Artists Volume II and III respectively, Reverie, lot 65, and Sweet Dreams Baby!, lot 66, signaled the meteoric rise of Roy Lichtenstein and endured as two of the greatest prizes in all Post-War printmaking. Mature and masterful, these images belied any notion that contributions to the 11 Pop Artists portfolios were Lichtenstein’s experimental forays into printmaking. Reverie and Sweet Dreams Baby! demonstrated that years of experimentation preceded such ingenious screenprints. In 1948 a seminal exhibition of prints arrived in Cleveland and that same year Lichtenstein took up printmaking while a student at Ohio State University. Making more than 30 editions between 1948 and 1959 that he printed, Lichtenstein learned the techniques of etching, aquatint, lithography, drypoint, screenprint and woodcut. He participated in the whole life cycle of Reverie and Sweet Dreams Baby!, working from preparatory drawings to printing and proofing. A long history with prints notwithstanding, Lichtenstein regarded his contributions to the 11 Pop Artists portfolios as his very first fine art prints, the culmination of years spent preparing. Reverie mothered a visual vocabulary that democratized art history. Its face was familiar to many; from the 1964 comic Secret Heart, the central figure was an avatar for new collectors who were backed by rapid economic expansion in Post-War America. Reproductive techniques and regularized colors more typical of commercial printing delivered a recognizable and conventionally pretty picture that launched previously discredited “cartoon” imagery back into art history. Lichtenstein’s musings on popular imagery sidelined any ongoing notions that art should remain cloistered with obfuscated meaning. 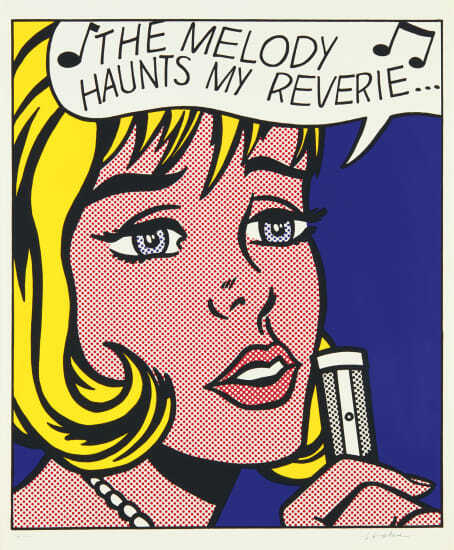 Lichtenstein recalled, “There is a relationship between cartooning and people like Miró and Picasso,” and, “I want [my subjects] to come through with the immediate impact of the comics.” If Reverie interrupted Post-War aesthetics politely then Sweet Dreams Baby! delivered a final blow to legacies of the 19th century. “Art since Cézanne,” Lichtenstein noted “has become extremely romantic and unrealistic . . . it has less and less to do with the world.” Regarding some of his contemporaries, such as the Abstract Expressionists, as the present-day incarnation of that problematic history, Lichtenstein came out swinging. Screenprint in colors, on smooth wove paper, with full margins. Signed and numbered 69/200 in pencil (there were also 50 proofs in Roman numerals and approximately 5 artist's proofs), published by Original Editions, New York, framed.